What will YOU be doing Thursday at 10 PM EST? I know what I’ll be doing – speaking on Geek Soul Brother’s podcast about “Women in Geek Media”! It’s my first time on a podcast and I’m really excited (and nervous but shhh! don’t tell anyone!). 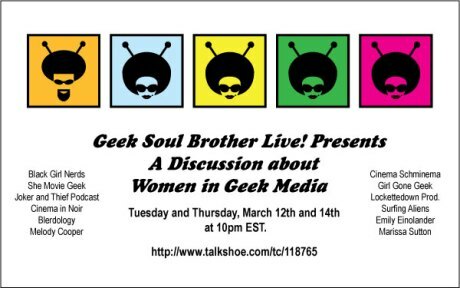 “In honor of Women’s History Month, Geek Soul Brother Live! presents Two Women’s Panels to focus on ‘Women in Geek Media’ – Scheduled Tuesday and Thursday, March 12th and 14th at 10 PM EST. Gathered together are these exceptional Ladies of Geekdom to discuss the roles and images of women in film, television, comics, anime and even games. Tuesday’s Panel will feature the Ladies from: Black Girl Nerds – She Movie Geek – Joker and Thief Podcast – Cinema in Noir – Blerdology – as well as Melody Cooper. Thursday’s Panel will feature the Ladies from: Cinema Schminema – Girl Gone Geek – Lockettedown Productions – Surfing Aliens – as well as Emily Einolander and Marissa Sutton. Where did the hipsters come from and why do they make ‘real’ geek girls mad? When male writers get a female character right, where do they still miss the mark? What will it take to get more women in the creative seat? Posted on 2013.12.March, in Irregular Posting and tagged geek culture, geek soul brother, hipsters, podcasts, women in comics, women in entertainment, women in geek media. Bookmark the permalink. 18 Comments. Thanks!! I’m still trying to listen to yours but today for sure! So you play one of the women? No, I play Geek Soul Brother. Duh. Women in science-fiction is an interesting topic, since they get closer than a lot of genres. I look forward to it. ha ha!!!!! You’ll be great. Sorry I missed this! Been so busy. I’ll be sure to go to the archives and give it a listen! Can’t wait. Looking forward to it!